Thanks to the guys at Sammobile, we have gotta our hands on something that appears to be the official changelog of the Android Kitkat update for the Samsung Galaxy Note 3. 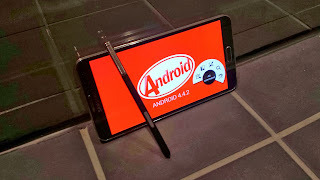 The changes reported in the changelog includes the changes found in the Google Android 4.4 Kitkat version such as the ability to choose the default messaging app, launcher, notification bar colours from the settings menu, other features such as the immersion mode have been present the Official Samsung Android 4.3 in Samsung devices. If you are interested in the viewing the changelog you can download the Microsoft presentation file from this link.